It used to be, in the more civilized days of yore, that Christmas revelry was confined to that period between Thanksgiving and New Year's Day. 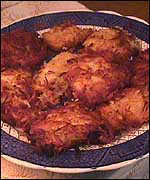 Latkes. Yum. Love them. Here are my recipes for both plain potato pancakes and curried sweet potato latkes. You'll love them. Honest! Time to make the Sufganiyot. . . 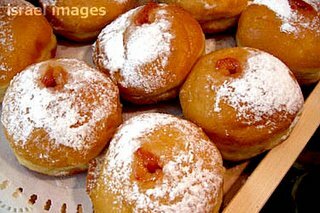 In Israel it is customary to make doughnuts, aka Sufganiyot, for Hanukah. Because doughnuts are fried in oil, they make a perfect treat for hanukah, especially after a nice big latke dinner where you're stomach is groaning already from all those potatoes fried in oil. Here are a few recipes I've used over the years, but the most popular, in least in our house, are jelly donuts. Here is Joan Nathan's recipe for Sufganiyot from The Jewish Holiday Kitchen and after the recipe is her note on the history of the Sufganiyot. I've had so much fun looking at and collecting hanukiyot over the years. My family has a pretty decent collection including the one I had as a child, one I bought in Toledo, Spain, a couple the kids made, and of course their childhood hanukiyot as well. The one from Toledo comes with an interesting story. For those of you who aren't history students, Toledo was, prior to 1492, a largely Jewish city on a hill in central Spain, about 60 miles south of Madrid. Toledo was well known as a city that was not only tolerant of its Jews and Muslims, but that encouraged trade between the 3 major religious populations until their expulsion in 1492 (Jews) and 1502 (Muslims). Today when you visit Toledo, the Spanish guides and residents try desperately to downplay the Alhambra Decree, aka the Edict of Expulsion for Jews ordered by King Ferdinand and Queen Isabel on March 31, 1492. If they are directly asked "What happened to all the Jews?" they will say things like "Oh, when the Jews left Toledo..." implying that they left of their own volition and not because they were forcibly thrown out of the country by Christians intolerant of their religious beliefs. I was poking through the shops when I found one that had, way up on the tip top shelf of his store, a brass hanukiah. When I asked to see it, the shopkeeper told me in Spanish that it wasn't the right number of branches and nobody wanted it because it wasn't Jewish. Ahem. In my broken Spanish I explained that it was a hanukiah and not a menorah, and that indeed I did want it for just that purpose. I took it home with me and have used it ever since. Here are our hanukiyot. I'm sure we'll add to this collection as the years pass. And now, part two of the great hanukiyot hunt. 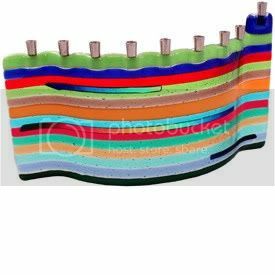 Unbeknownst to many families, Jewish families often purchase a hanukiyot for each member of the family so that everyone has a special hanukiyot of their own to light on Hanukah. In our small family we've gone overboard, not surprisingly, and each of us as at least two hanukiyot to light during the holiday. I've been collecting photos of beautiful hanukiyot for years now. Because I've collected so many different designs, over 50 in fact, I can't possibly present them all in one post. 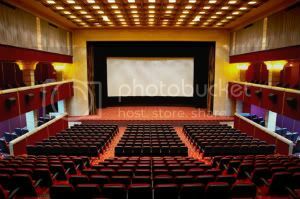 So I'm presenting a variety of different types of hanukiyot that will ensure you'll find at least one you love and covet. Secret Spaces, Hidden Gems: I'm HUNGRY! The Busy Bee is a diner. Not a fake, Johnny Rocket's type diner. A real live, old fashioned, corned beef and cabbage, pot roast dinner with mashed potatoes diner. Open for breakfast and lunch daily, the Busy Bee is one of our absolute favorite restaurants. The food is good, the atmosphere is amazingly nostalgic, the staff hilarious, the menu extensive, and the prices are unreal. The Busy Bee is located right outside of Audobon Circle on Beacon Street, right on the Brookline-Boston Line. It is essentially in a BU neighborhood, but so many old neighborhood types frequent the restaurant that you would never know it's so close to a major university. I discovered the Busy Bee when I moved to Boston for graduate school in 1976. I lived right around the corner from this dingy looking place, but my roommates told me it was absolute gold inside. Once I ventured in, I was hooked. It's cheap, dirt cheap. The food is all home cooked right on the premises. It's delicious food and the atmosphere... well, if you're older than dirt you'll remember the John Belushi "Cheeseburger cheeseburger" routine on the original SNL. That's the Busy Bee. It's a family owned place. The family is Greek. They yell at each other. The same customers have been coming in since the beginning of time. Everyone is friendly, but the waitresses can be a bit brusque if you take too much of their time. Yelp says: This is a breakfast spot/diner with an extensive menu at dirt-cheap prices. 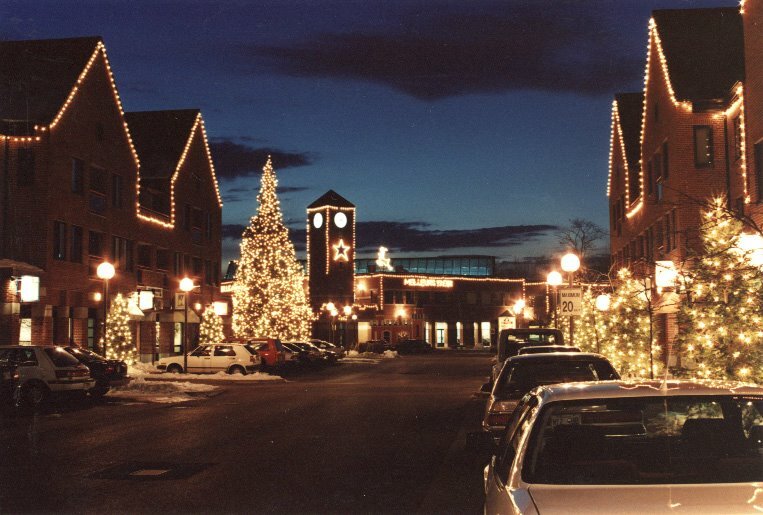 Get past the nondescript exterior to find an establishment that has been doing business for decades. Service is fast and swift, so it is a great place to head for one of those quick-yet-satisfying meals. Regulars have been returning here; some for decades; for heart-stopping breakfast platters and lunch and dinner specials that are easy on the wallet, if not the cholesterol levels. Does not accept credit cards; accepts cash only." That's exactly right. They got the entire essense of the Busy Bee on one little paragraph. As a long time customer, I can remember when they only used those cone-shaped cups that sat inside a silver holder. Now when was the last time you saw those? And the plates? They are divided into portions. It's 1958 all over again. But this isn't nostalgia happening. This place just never changed. A few booths, some seats at the counter, old dusty plants in the window... it could be anyplace in America. The food? Thick potatoes with onions and all the good stuff for the homefries. Eggs made to order and made to perfection. Ohhh, the hash. A delightfully fattening mix of corned beef, potatoes, peppers, onions, and about a half-pound of butter, probably. Get the Fresh Fruit Bowl to-go, which for $3.25, it's brimming with pineapple, strawberries, blueberries, grapes and melon. Besides the $5 breakfast....my other favourite aspect is that all the waitresses yell at you in their thick New England accents. Having someone yell "WADDYA WANNT? WHITE OR WHEAT?? I AIN'T GOT ALL DAY" in regards to what sort of bread you want toasted, is the most delightful way to start the day. The waitresses are always available with a "Hi Hon" or "Sure Dear" (albeit somewhat snarky - picture Alice, Vera and Flo from Mel's Diner) to start the day. From Peter screaming for French Fries behind the counter to the cranky waitresses with a heart of gold, the entire staff oozes authenticity. Try the Cheeseburger Deluxe (still under 4 bucks I believe) or any of the great daily specials. Best cole slaw in the city and the fries are deep fried just right. I've been going here for about 30 years. I remember when the staff, (mostly family members) would be fighting with each other so loudly, I fully expected fisticuffs. Didn't make for casual dining although now it's quieter even with same waitress though She's "a doll" and quickly makes you feel like a regular by berating your ability to place your order in a timely fashion. She's just kidding though. I had to think long and hard to decide whether or not I wanted to share this Hidden Gem. But my daughter, who is a huge fan of their corned beef, said it would be wrong not to. So go, but if you see me there and it's crowded, thats MY booth you're sitting in. Every summer my children and I make a pilgrimage. Not to a religious site, not to learn how to meditate or do yoga. Nope, we head north to Maine and go to Yummies. 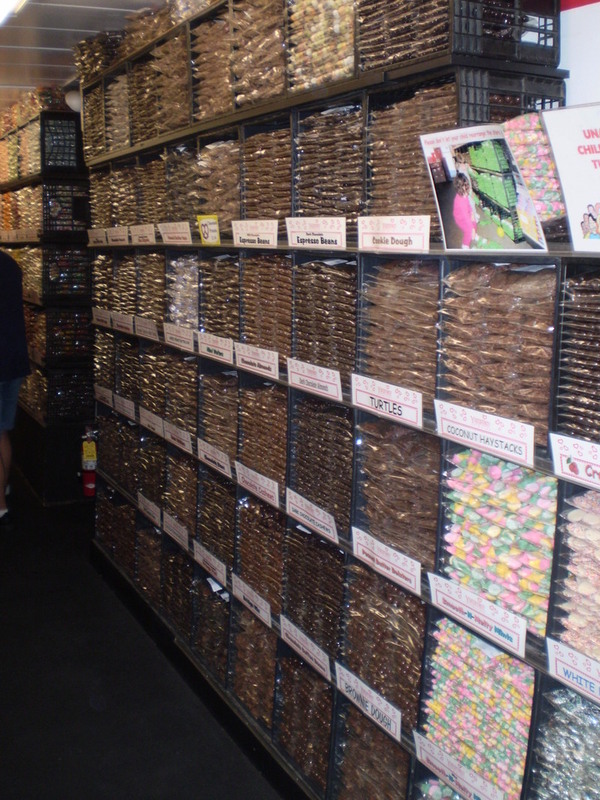 For those who don't watch the Phantom Gourmet or aren't familiar with the outlet town of Kittery Maine, Yummies is an enormous candy store. Not just any candy store. 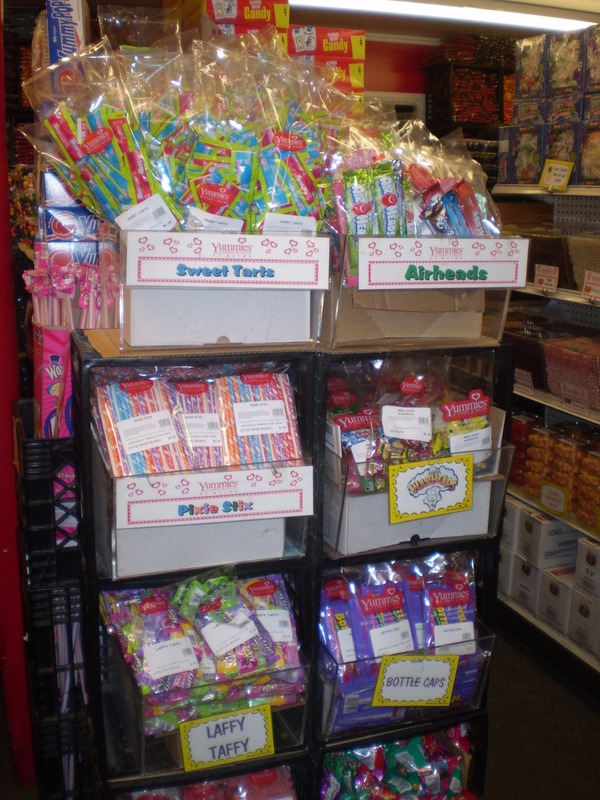 A store that prepackages nostalgic candy as well as pretty much every kind of candy bar and box you've ever seen. Not just American candy either. Oh no, they have international favorites as well. 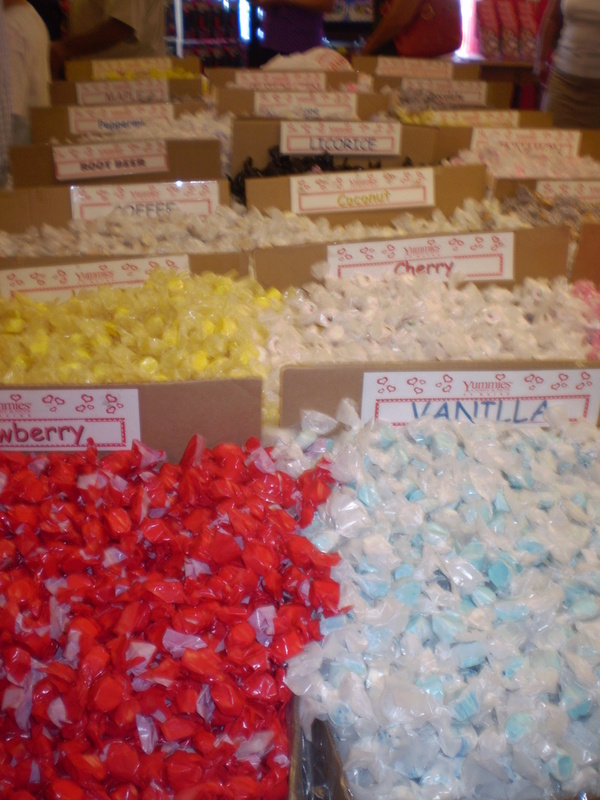 Yummies has the largest assortment of salt water taffy I've ever seen. They have some really 'interesting' flavors but my favorite, by far, is creamsicle. With root beer float coming in a close second. 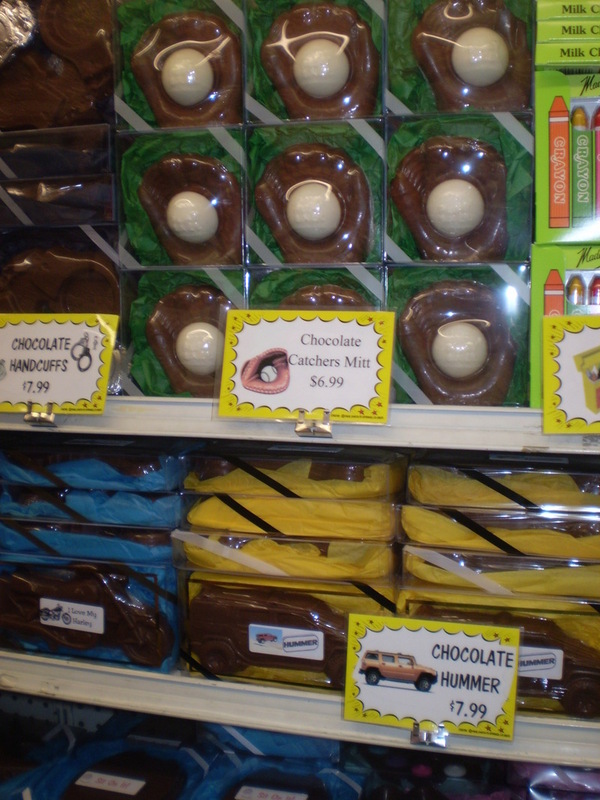 Yummies carries a huge supply of chocolate candy, some custom made, some repackaged in the back of the store. They make their own fudge, they have gigantic lollypops and quite a bit of the type of candy you might find in a 1950's penny candy store. 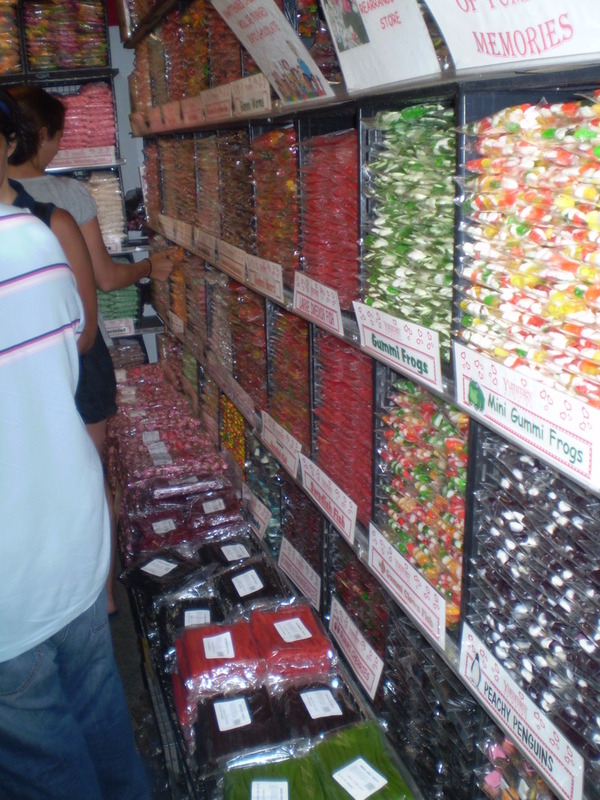 They have gigantic gobstoppers, candy cigars and cigarettes, pop rocks, red hots, wax lips, and gummys in every shape and size. 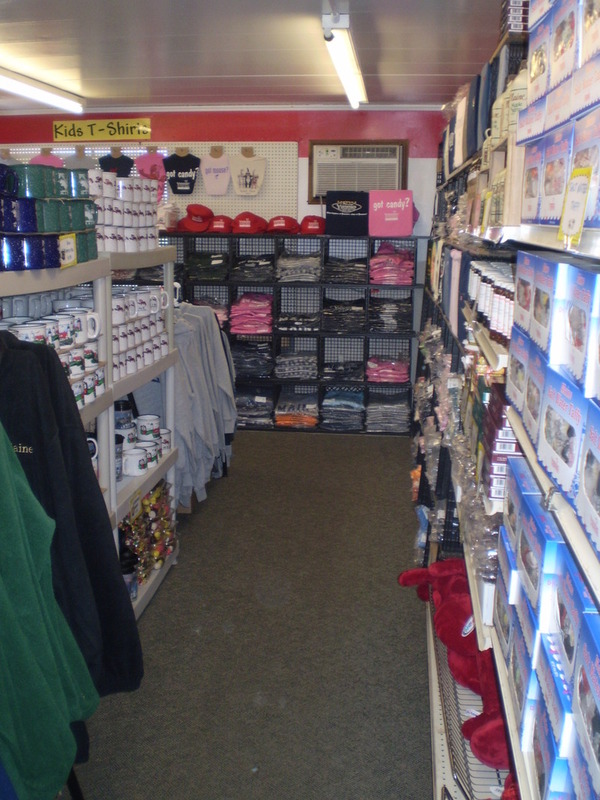 They also have a little gift shop, but honestly, who wants to spend money on souvineers when there is candy to buy? Not us. We've never bought as much as a post card there. But we've come home with bags and bags of candy. 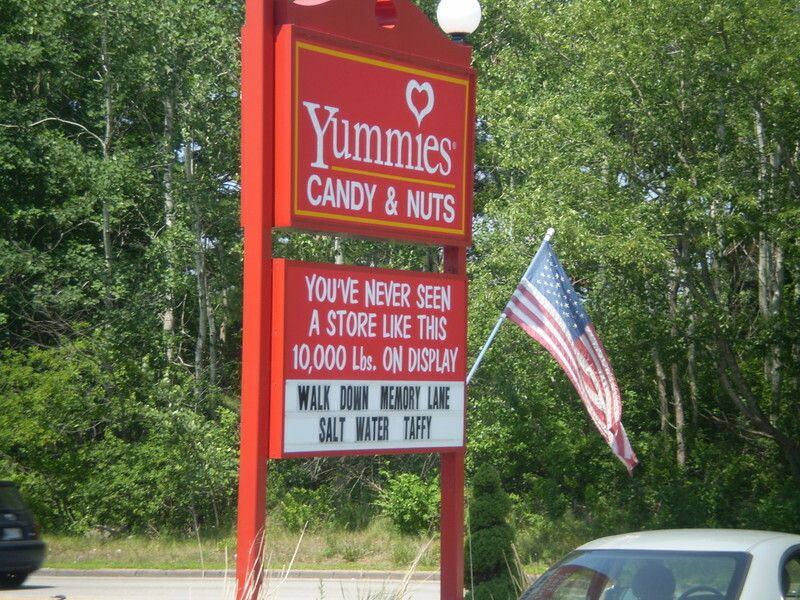 If you're heading up to the beach in Maine, make sure to stop at Yummies. It's not just candy, it's an adventure.